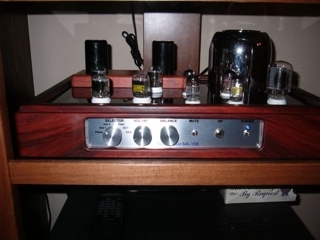 Here is a custom built line level pre-amp & headphone amplifier. 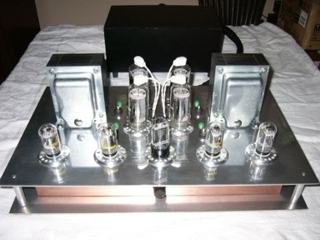 This amplifier is a special proprietary designed mu-follower with a 6MJ8 (All three triodes paralleled for the lowest noise and output impedance) as the gain tube and a 6MN8 as the current source for each channel. This is an extremely stable natural sounding pre-amp that uses no feedback and has no electrolytic capacitors in the signal path- only in the power supply. The high voltage power supply regulator circuit uses a horizontal sweep tube followed with an oil filled capacitor. Secondary filtration with electrolytics by-passed with film caps. Regulated D.C. filament supplies are used for the 6MJ8 and 6MN8 tubes. The front panel has a four position selector switch, mute switch, volume, balance and headphone jack. The back panel has two sets of line out (RCA) four sets of RCA inputs, IEC connector and fuse holder. Using as a headphone amplifier there is plenty of headroom with 92 volts peak to peak that will sufficiently drive any headphone from 10 – 2,000 ohm impedance. As a line pre-amp you have 17dB of gain without feedback. To sum up, this preamp uses no feedback, no transistors; no electrolytic capacitors in the signal path, parallel triode sections for extremely low impedance and noise with horizontal sweep tube rectification and D.C. filament supplies. 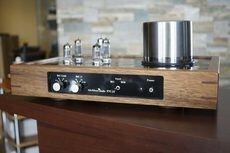 This unit can serve as a high end purity line stage and also a superb headphone amplifier. Additonal shipping or customs duty and brokerage fees if applicable. 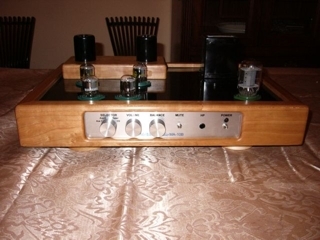 Here is a custom built line level pre-amp & headphone amplifier. This model is the same as the MA-10B but has a remote control for the volume and inputs with some additional unique features. This pre-amp is still analogue for the audio as the digital circuitry operates a motorized volume and relays for the inputs. A special proprietary designed mu-follower with a 6MJ8 (All three triodes paralleled for the lowest noise and output impedance) as the gain tube and a 6MN8 as the current source for each channel. This is an extremely stable natural sounding pre-amp that uses no feedback and has no electrolytic capacitors in the signal path- only in the power supply. The high voltage power supply regulator circuit uses a horizontal sweep tube followed with an oil filled capacitor. Secondary filtration with electrolytics by-passed with film caps. Regulated D.C. filament supplies are used for the 6MJ8 and 6MN8 tubes. The front panel has a four position selector switch, mute switch, volume, and balance and headphone jack. The back panel has two sets of line out (RCA) four sets of RCA inputs, IEC connector and fuse holder. Using as a headphone amplifier there is plenty of headroom with 92 volts peak to peak that will sufficiently drive any headphone from 10 – 2,000 ohm impedance. As a line pre-amp you have 17dB of gain without feedback. Additional shipping or customs duty and brokerage fees if applicable. The MA-15 shares the identical circuit as the MA-10B line amplifier with the addition of a 4-tube M/M phono stage. This amplifier is a special proprietary designed mu-follower with a 6MJ8 (three triodes paralleled for the lowest noise and output impedance) as the gain tube and a 6MN8 as the current source for each channel. This is an extremely stable natural sounding pre-amp that uses no feedback and has no electrolytic capacitors in the signal path- only in the power supply. 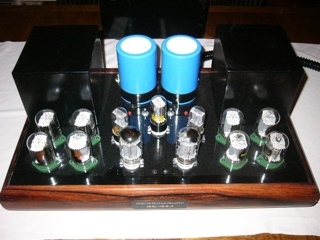 The phono stage uses 4 x 6N2P and one12AT7 tube in a special proprietary phono stage with separate regulated high voltage and D.C. filament supplies. RIAA equalization is passive with no feedback. The high voltage power supply regulator circuit uses a horizontal sweep tube followed with an oil filled capacitor. Secondary filtration with electrolytics by-passed with film caps. Regulated D.C. filament supplies are used for the 6MJ8’s and 6MN8’s. The front panel has a four position selector switch, mute switch and volume. The back panel has two sets of line out (RCA) four sets of RCA inputs and IEC connector. As a line pre-amp you have 17dB of gain without feedback and 30db of gain in the phono stage. To sum up, this preamp uses no feedback, no transistors; no electrolytic capacitors in the signal path, horizontal sweep tube regulation with D.C. filament supplies. The PH-10 has both M/M & M/C inputs with a separate power supply. Front panel input selectors for both the moving coil and moving magnet inputs. The moving coil load selector range 20/50/150/250/500/1000 and moving magnet 47/100/500/1K/10K/47k. The power supply supplies two well-regulated high voltages to both M/M & M/C stage along with regulated D.C. filament supplies. A 9 volt battery (rear connected) is used to power part of the first MC gain stage FET and is relay operated through the power supply. This is a common alkaline type that should last 75 hours. Tube compliment 4x 6N2P and one 12AT7. RIAA equalization is passive with no feedback with 30dB MM and 30dB MC gain. The SE-32P utilizes a pair of horizontal output tubes paralleled in triode mode to produce 12 watts per channel in class A. The input stage for each channel utilizes my proprietary constant current/infinite plate load resistance design that combines both triode sections of a 6N1P as the voltage amplifier and a 6CL6 as the current source. This is a true constant current source that will properly respond to the signal / voltage changes without a resistor dropping large amounts of voltage, typically in standard Mu follower circuits. This circuit design operates the input tubes at optimum linearity and is not subject to high plate load resistance or internal tube resistance to set the gain & linearity characteristics. The driver stage for each channel uses a 6SN7 of which one triode provides drive regulation and the other triode directly drives the output tubes- no coupling capacitors are used! The only capacitors in the signal path are between the input and driver stage. 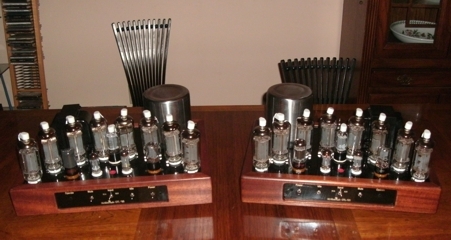 The output stage for each channel consists of two 12DQ6 horizontal sweep tubes paralleled in triode mode operating in class A. Without coupling capacitors each output tube receives the identical signal and therefore both output tubes can be electrically considered as one tube. 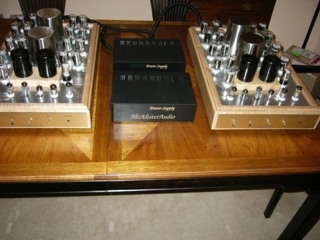 The output transformers are custom designed and hand wound by McAlister Audio with four primary and three secondary interleaved sections with each layer varnished prior to insulation. A separate well-regulated bias supply with external top chassis mounted adjustments. The power supply has over 2,000uF of initial capacitance bypassed with film capacitors. Electrolytic capacitors are only used in the power supply and never in the signal path. Plate voltage is delayed 40 seconds automatically on turn on to prevent cathode stripping Wiring is point to point with no circuit traces. A Separate power supply chassis that contains only transformers and relays with all rectification and regulation in the amplifier chassis. Only AC travels through the umbilical isolating D.C. signal voltages ensuring no possibility of interference. 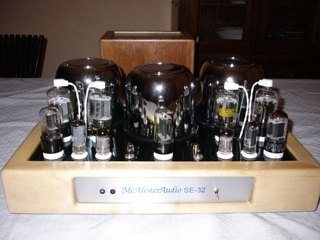 The MA-44 stereo single ended power amplifier utilizes four horizontal output tubes paralleled in triode mode to produce 22watts per channel in class A. The input stage for each channel utilizes my proprietary constant current/infinite plate load resistance design that uses a 6LU8 with the pentode section triode wired as the current source and the triode section the voltage amplifier. This is a true constant current source with more than enough gain to properly respond to the small signal / voltage changes without a plate load resistor dropping large amounts of voltage typically in cascade designs. 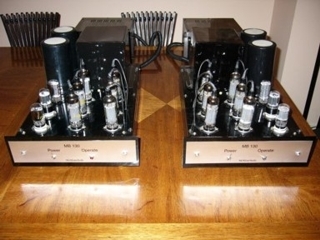 The driver stage uses a 6SN7of which one triode provides regulation with the other triode directly driving the output tubes in a cathode follower configuration without the need for capacitors. The only capacitors in the signal path are between the input and driver stage. The output stage for each channel consists of four 12DQ6 horizontal sweep tubes paralleled in triode mode with class A operation. No coupling capacitors are used to drive the output tube grids so in effect all tubes are connected together as one. This output configuration can pass a large amount of current with harmonic distortion in dB relative fundamental of 2nd -26, 3rd -44, and 4th - 60. A separate and well-regulated bias supply with external top mounted chassis adjustment. The negative voltage is adjustable and fed to the control grid of the drive tube which determines the current flow in the output tubes. All of my power amplifier designs use a fixed bias voltage that eliminates the cathode resistor and electrolytic by-pass cap producing an amplifier with fast rise time, superior dynamics and transparency. The output transformers are custom designed and hand wound with four primary and three secondary interleaved sections with each layer varnished prior to insulation. The power supply has over 2,000uf of capacitance by-passed with film capacitors- electrolytic capacitors are only used in the power supply and never in the signal path. Plate voltage is delayed 30 seconds to prevent cathode stripping. This automatic system uses a damper diode providing D.C. relay voltage through a controlled warm up. Wiring is point to point with no circuit traces. A Separate power supply chassis that contains only transformers and relays with all rectification and regulation in the amplifier chassis. Only AC travels through the umbilical isolating D.C. signal voltages ensuring no possibility of interference. 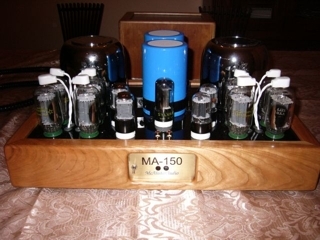 The MA150-8 stereo power amplifier utilizes 8 horizontal output tubes producing 75 watts per channel. Four output tubes per channel lower the AC plate resistance allowing a smaller transformer turns ratio. 12EM7/12EA7 dual triodes are used for the input, phase splitter and driver stages with 12DQ6/6GW6 horizontal tubes in the output stage. Bias voltage is derived from a separate source and is well regulated with external top mounted adjustments. Fixed bias voltage eliminates the cathode resistor and electrolytic by-pass cap producing an amplifier with a very fast rise time, superior dynamics and transparency. The output transformers are custom wound M6 core that have 4 primary and 3 secondary sections with each layer dipped in varnish prior to insulation. Plate voltage is delayed 30 seconds to prevent cathode stripping. A Separate power supply chassis that contains only transformers and relays with all rectification and regulation in the amplifier chassis. Only AC travels through the umbilical isolating D.C. signal voltages ensuring no possibility of interference. The power supply has over 2,000uf of capacitance by-passed with film capacitors. Electrolytic capacitors are only used in the power supply and power distribution networks. Distortion and speed are greatly improved with the addition of a drive stage between the front end 1st gain / phase splitter and output stage. The end result is an extremely stable high wattage power amplifier that has a flat frequency response; low distortion and output stage/transformer overshoot of less than 1%. The MB-130 mono block amplifiers share the same circuitry as my MA150-8 amplifier but are dual mono with 6 output tubes per channel. 12EM7 dual triodes are used for the input, phase splitter and driver stages and EL504/PL504 horizontal tubes for the output stage. Bias voltage is derived from a separate source and is well regulated with external top mounted adjustments. Fixed bias voltage eliminates the cathode resistor and electrolytic by-pass cap producing an amplifier with fast rise times, superior dynamics and transparency. The output transformers are custom wound M6 core that have 4 primary and 3 secondary sections with each layer dipped in varnish prior to insulation. Plate voltage is delayed 30 seconds to prevent cathode stripping. Separate power supply chassis that contains only transformers and relays with all rectification and regulation in the amplifier chassis. Only AC travels through the umbilical isolating D.C. signal voltages ensuring no possibility of interference. The power supply has over 2,000uf of capacitance by-passed with film capacitors. Electrolytic capacitors are only used in the power supply and power distribution networks. Distortion and speed are greatly improved with the addition of a drive stage between the front end 1st gain / phase splitter and output stage. The end result is an extremely stable high wattage power amplifier that has a flat frequency response; low distortion and output stage/transformer overshoot of less than 1%. This unit uses similar circuitry to my MA-150-8 but with 60 watts per channel. 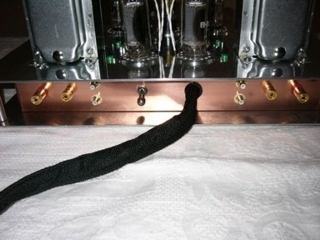 Polished top and bottom plates with a copper sub chassis along with polished transformer covers. 12EM7/12EA7 dual triodes are used for the input, phase slitter and driver stages and PL-509 horizontal tubes for the output stage. Bias voltage is derived from a separate source and is well regulated with external top mounted adjustments. All of my power amplifier designs use a fixed bias voltage that eliminates the cathode resistor and electrolytic by-pass cap producing an amplifier with fast rise times, superior dynamics and transparency. The 12EA7/12EM7 dual triode has one section similar to the 6SN7 but with a 10 watt plate dissipation and the other similar to the ECC83. In each channel the two 12EA7/12EM7 sections do the first stage gain and phase splitting while the second 10 watt sections accomplish the drive for each output tube. The output transformers are custom wound M6 core that have 4 primary and 3 secondary sections with each layer dipped in varnish prior to insulation. Plate voltage is delayed 30 seconds to prevent cathode stripping. The separate power supply uses a massive power transformer system. High speed diodes, regulation and 2x 15,000uf of capacitance paralleled with film capacitors. Electrolytic capacitors are only used in the power supply and power distribution networks. Distortion and speed are greatly improved with the addition of a drive stage between the front end 1st gain / phase splitter and output stage. The end result is an extremely stable high wattage power amplifier that has a flat frequency response; low distortion and output stage/transformer overshoot of less than 1%. This amplifier comes complete with a detachable power cord, IEC input, ceramic tube sockets, NOS tubes, and instruction manual with bias instructions. Tube compliment 4x 12EA7 / 12EM7, 4x Pl-509. This unit comes with a two year warranty parts and labour except the tubes that are covered for 90 days. The MA160-8 integrated stereo power amplifier utilizes 8 horizontal output tubes producing 75 watts per channel. Four output tubes per channel lower the AC plate resistance allowing a smaller transformer turns ratio. 12EM7/12EA7 dual triodes are used for the input, phase splitter and driver stages with 12DQ6/6GW6 horizontal tubes in the output stage. Bias voltage is derived from a separate source and is well regulated with external top mounted adjustments. Fixed bias voltage eliminates the cathode resistor and electrolytic by-pass cap producing an amplifier with a very fast rise time, superior dynamics and transparency. The output transformers are custom wound M6 core that have 4 primary and 3 secondary sections with each layer dipped in varnish prior to insulation. Plate voltage is delayed 30 seconds to prevent cathode stripping. 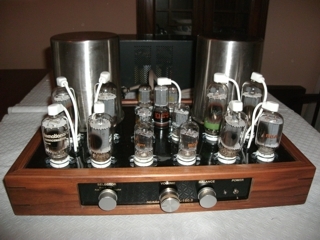 The pre-amp section is similar circuitry to my MA-10 using 6JZ8 tubes with the pentode sections wired in triode mode. Superb non feedback amplification for an open, musical sound stage. 3 inputs and a pre out. A Separate power supply chassis that contains only transformers and relays with all rectification and regulation in the amplifier chassis. Only AC travels through the umbilical isolating D.C. signal voltages ensuring no possibility of interference. •	Inability to drive low impedance loads. •	Numerous adjustments to keep internal signal balance. •	D.C. offset voltage; in fact some manufactures use large capacitance in series with the output tubes and speaker load to eliminate D.C. Any time large electrolytic capacitance is used in the signal path performance suffers. With this in mind I designed an OTL that overcomes all these issues- the original prototype designed 14 years ago is used in my home as the main amplification and still has the original output tubes. Completely balanced from input to output with only three user adjustments required and internal balance that is not dependent on tube emissions. The ability to properly drive 4 ohm load impedances. No electrolytics in the signal path and horizontal sweep tubes in the output stage that have lower second and 4 th harmonics, pass lots of current and are extremely reliable compared to the standard array of audio tubes. A very unique circuit that tracks the signal level in the driver stage and modulates the control grids of the output tubes. This gives superb efficiency as a super cathode follower and at low to moderate signal levels the output tubes are only operating at 1/3 of their plate dissipation. In addition the idle switch on the front panel reduces the operating current in the output stage to a fraction of the sum- a great standby feature. 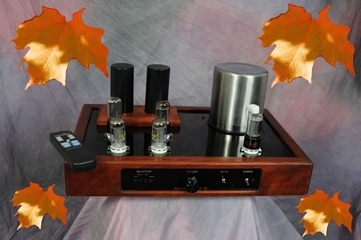 The OTL-195 using no output transformers with superb reliability, low output impedance, directly coupled is the best amplifier that I have designed and is distinguished from all other amplifier designs with a magical musical sound.